Antenna Magus version 3.2 released! Antenna Magus 3.2 is the 16th product update since the release of Version 1.0. With a growing database of 159 antennas, 10 transitions and more handy calculators added to every release, the product has established itself as an essential tool in any antenna engineers' toolbox. This newsletter will focus on 5 new antennas, a microstrip to CPW transition and the handy Friis equation calculator that has been added since the release of version 3.1. 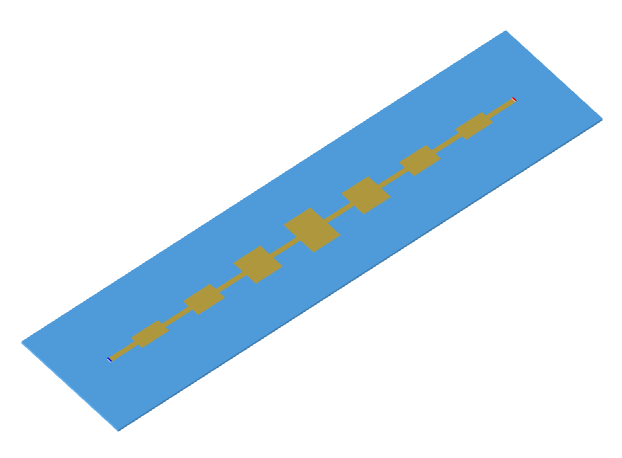 Image of the Traveling series-fed patch array antenna. Series-fed microstrip patch arrays are light weight, low profile antennas typically used for communication and in microwave sensor applications. The traveling-wave series-fed patch array is related to the resonant series-fed patch array (already included in the Antenna Magus database), but has a different design approach and operation mechanism, providing different performance characteristics and options. Where the resonant series-fed patch array provides in-phase excitation for efficient broadside radiation, the patches of the traveling wave array are spaced to produce a progressive phase shift between patches. 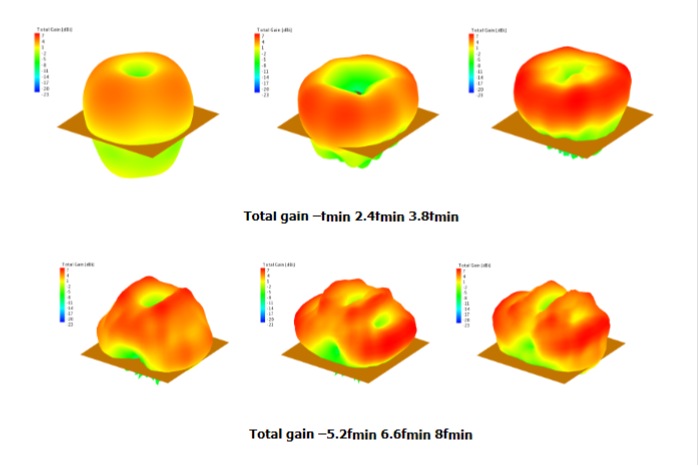 This results in a fan beam which squints off broadside and scans with frequency. The traveling-wave design can achieve high gain (up to 20 dBi) at a specified squint angle. 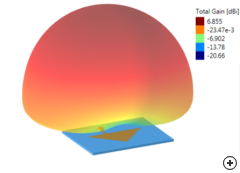 As with most traveling-wave array structures (like slotted guide arrays), the operating bandwidth is narrow (typically 2%), and some energy is absorbed in a termination load resulting in a reduced radiation efficiency (typically in the order of 75%). 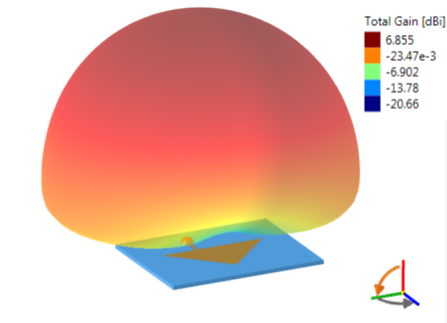 The Antenna Magus design provides 0.5% to 5% bandwidth design options and attempts to optimise the radiation efficiency according to the designed objectives. 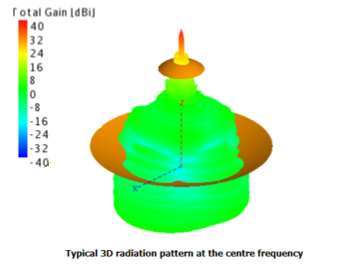 Typical fan beam pattern of a 12 element array. 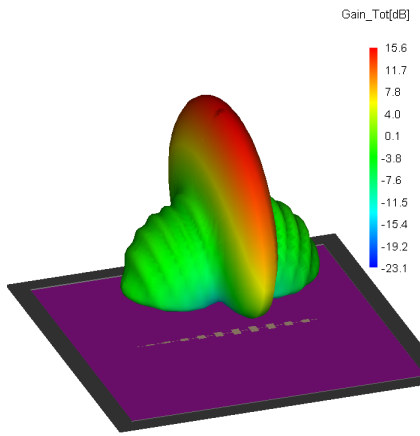 Gain patterns vs frequency of a traveling wave series-fed array designed for 18 dBi gain and a 10 degree squint at 10 GHz. [Note how the main beam scans with frequency]. Image of the Horn fed Gregorian Axisymmetrical dual reflector. Dual-reflector antennas are based on principles that have been used in optical telescopes for centuries. The Gregorian telescope was the first dual lens optical telescope. It provided a revolutionary advantage, in that the observer could look through the telescope while standing behind the main reflector, without getting in the way of the light from the observed object (an effective way of reducing aperture blockage!). The Gregorian dual-reflector antenna has a number of advantages when compared to the prime focus reflector. In cases where the housing for the feed electronics is electrically large, the feed can be positioned behind the primary reflector, reducing unwanted aperture blockage (provided, of course, that the sub reflector is smaller than the feed electronics). 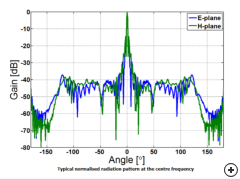 A second advantage is that for a given feed beamwidth the dual reflector configuration can reduce the antenna length and require shorter, less sturdy struts. The Gregorian dual-reflector is a very popular antenna for very high gain applications. 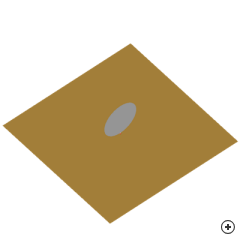 Similar to the Cassegrain reflector (already included in Antenna Magus), it transforms the low to medium gain radiation of the feed horn to a high-gain pencil beam. 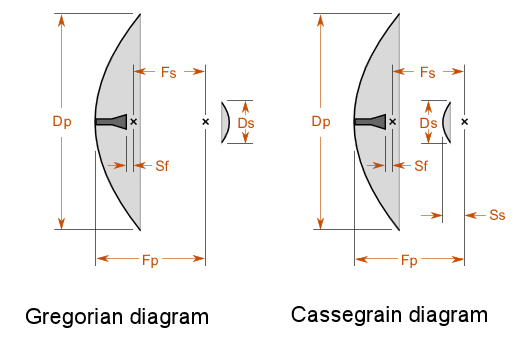 Difference between the Gregorian and Cassegrain configurations. 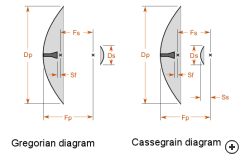 The above image shows the difference between the Cassegrain and Gregorian configurations. 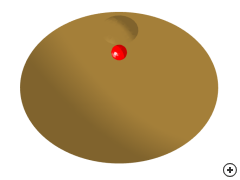 The main difference is the position and shape of the sub-reflector. There are various factors (like main reflector size, feed angle, strut size, feed blockage etc.) that influence which one of these reflector configurations are preferable for a specific application. 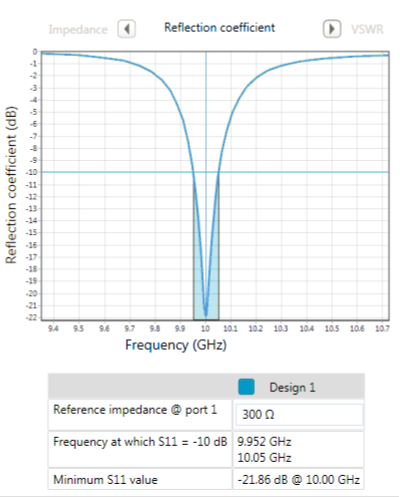 The image below shows a comparison between three different reflector configurations, designed using Antenna Magus. 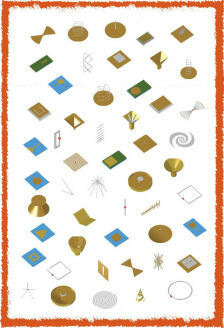 Each of these are designed at 20 GHz for 40 dBi gain using a horn feed with a 10 dB beamwidth of 45 degrees. 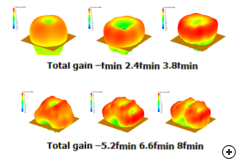 Comparing length and width dimentions between the Cassegrain, Gregorian and prime-focus reflectors for a 40 dB gain design in Antenna Magus using a 45 degree 10 dB beamwidth horn feed in all three cases. Note that the dual-reflector configurations both have much shorter physical lengths when compared to the single parabolic reflector. In the case shown, The Gregorian requires a primary reflector that is 11% wider than the Cassegrain to achieve the required gain. This is due to the aperture blockage. 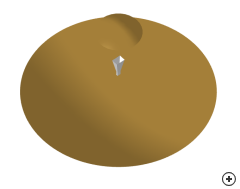 The Gregorian reflector can be designed in Antenna Magus for gains from 30 to 50 dBi, and the positioning and dimensions of the feed horn are included. 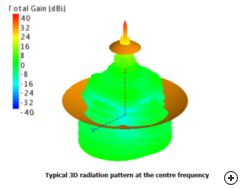 The radiation patterns shown below are for a Gregorian designed for an overall gain of 40 dBi, using a 10 dB feed beamwidth of 60 degrees. Image of the Pattern fed Gregorian Axisymmetrical dual reflector. 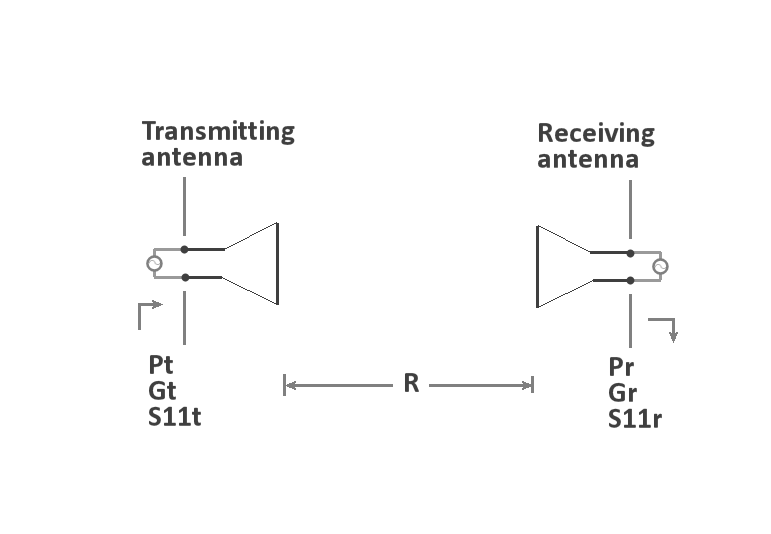 The Pattern-fed Gregorian dual-reflector antenna facilitates design and investigation of the Gregorian reflector independently from the feed antenna structure. 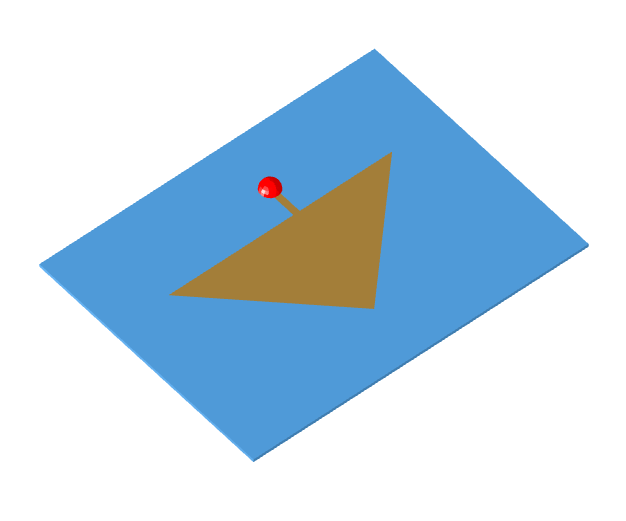 This approach is useful at stages in a design when the physical feed details are not important, or where a feed pattern other than that of a pyramidal horn is of interest. 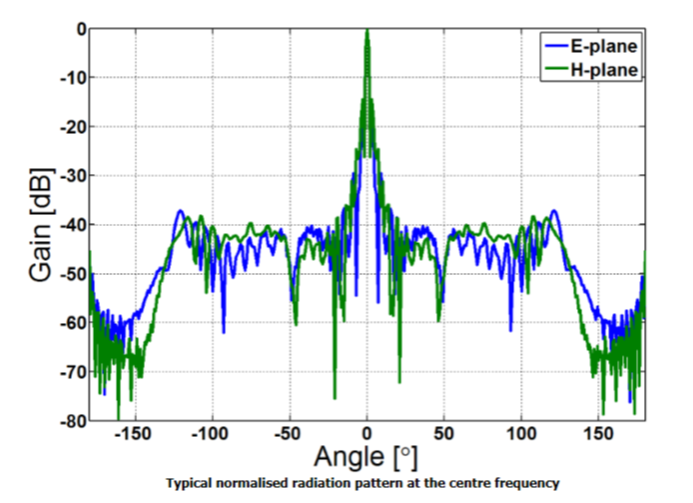 A detailed overview if the Horn-fed Gregorian dual-reflector antenna also included in the database can be found here. 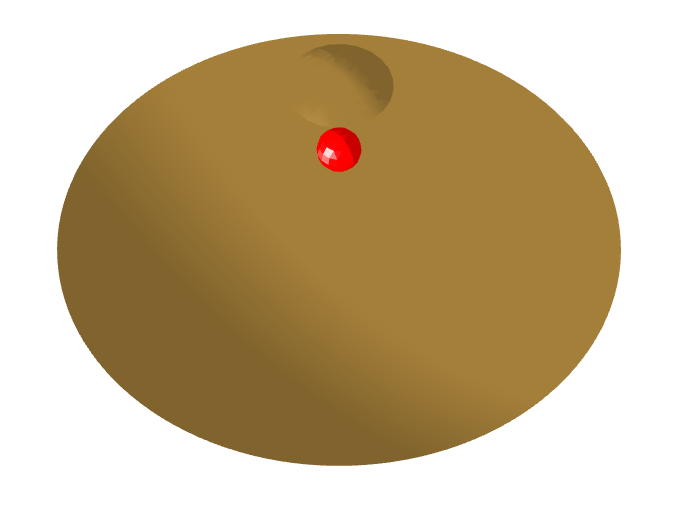 Image of the Circular disc monopole. Wireless communication systems have significantly increased the demand for low cost, ultra-broadband antennas that are capable of supporting high data speeds and multiband operation. 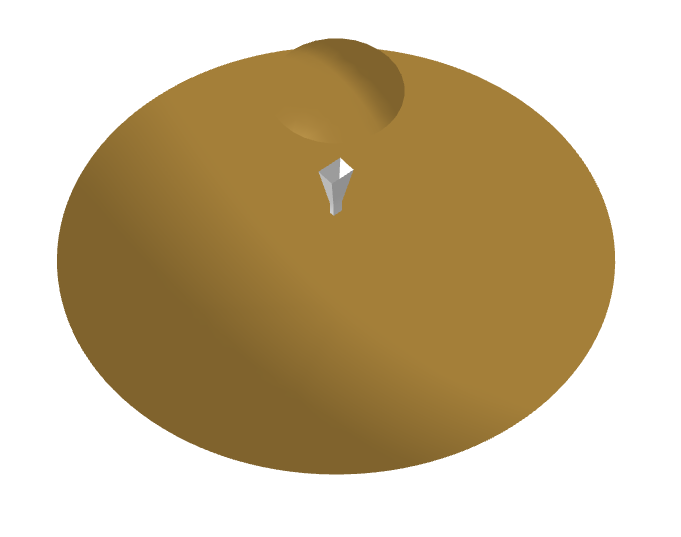 A planar monopole antenna that meets this requirement is the Circular disc monopole (CDM). By replacing the wire of a basic monopole with a circular conducting disk, a CDM with extraordinary impedance bandwidth (1:8 or more) can be achieved. 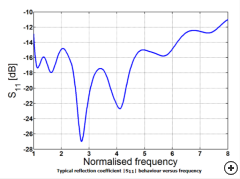 The performance graphs below show the 3D patterns vs frequency and the typical ultra-wideband reflection coefficient performance vs normalized frequency. 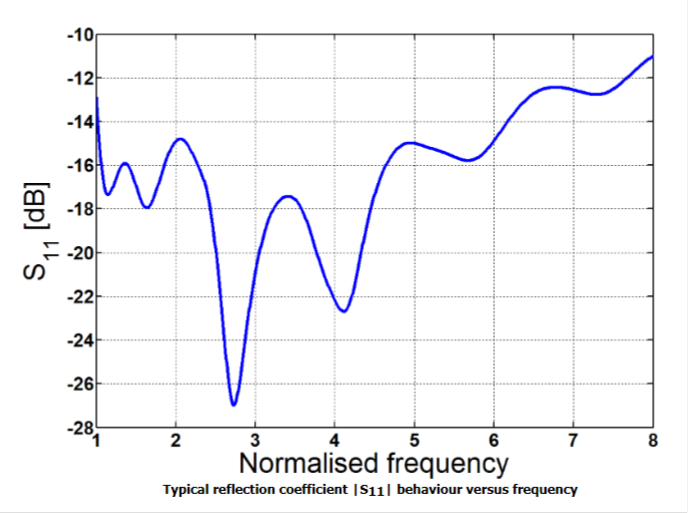 Typical reflection coefficient [|S11|] vs frequency. Diagram of the Friis equation calculator. 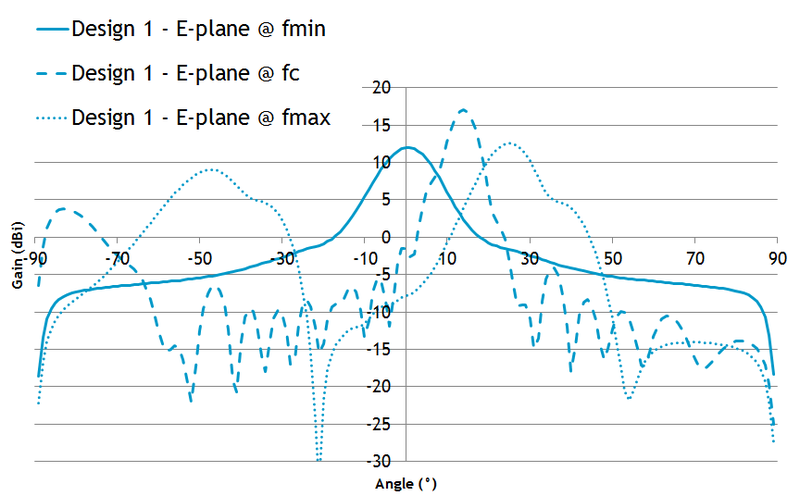 The Friis transmission equation is probably one of the most popular equations used by antenna engineers when considering the system level requirements or expected performance for a communications link. 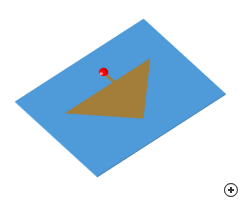 The equation relates the power received by an antenna to the power radiated by another antenna, located a specified distance away (in free space). This handy Antenna Magus calculator can quickly solve for any of the parameters in the system, given values for the other parameters. The modified form of the equation used in this calculator allows for antenna mismatch to be taken into consideration. 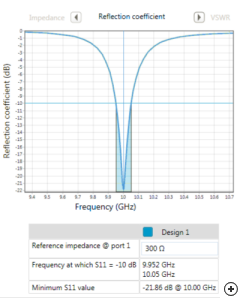 The following example shows how the Friis equation calculator can be used in Antenna Magus to solve for the required transmit antenna gain (Gt) in a typical aircraft to satellite communication systems application operating at Ka band. 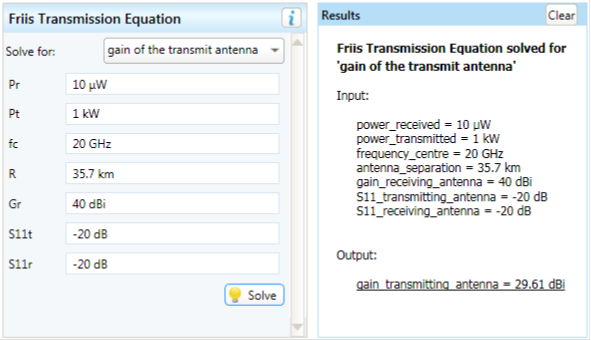 Friis calculator example in Antenna Magus.